Kids love to be in control. Give them options. For example, if you're making pizza, give them a choice of tuna or ham and then a few different veggies. They'll feel proud they got to choose, but they will still eat well. Everyone's a winner. Mess happens. Clear the surfaces of anything you don't want to get messed up, wear aprons, even use newspaper on the floor if you must, but don't worry. It's mess to grown ups but for kids it's exploring and part of forming a healthy relationship with food. Allow them to explore. Children’s food expert for Organix, Lucy Thomas, advises children to explore food by feeling, smelling and licking. Encourage them to describe the sensations, for example strawberries feel bumpy. My kids love to do this, even with food they don't like. They are exploring those foods, without feeling forced to eat it. Factor in the extra time. It's going to take ages. Choose a simple recipe and perhaps do some of the boring prep work in advance. Chopping half a pepper might be fun, but not three. Some kids lose interest quickly. Teaching kids about food hygiene is just as important as teaching them about food. Teach them to wash their hands properly and especially after touching raw meat, fish and eggs. I taught my kids this so young, but they really got it. They hold their hands up after handling raw eggs and say "I have eggy hands" on their way to the sink. You Tube is amazing for clips of where food comes from or how it's made. Mine have learned so much without leaving the house! Some of their favourites include, how olives are pitted, where pineapples come from and how carrots grow. It's so brilliant. Pick an easy, quick recipe, like whizzing up houmous - kids love gadgets. They can choose their own crudités. Make it fun, like half a jacket potato made into a boat with a slice of cheese sail and grated carrot sea. Kids are fickle. They love something one day and hate with a passion the next. Be consistent - little and often is the key. Don't feel discouraged or guilty if it's not worked out the first time. Don't force them. The right equipment can make all the difference. There's a little knife you can get from pampered chef which is super-safe but great for kids to cut vegetables with. Some kids might like their own special apron or baking kit. If your child is old enough, explain to them why certain foods are good for us. I have this great little book which explains why apples are healthy, because they contain 'boron for bones' to make us strong. You don't have to be an expert, just the odd little fact can encourage healthy eating for life. For lots more advice on toddler foods and tasty, healthy recipes for all the family please visit www.organix.com. 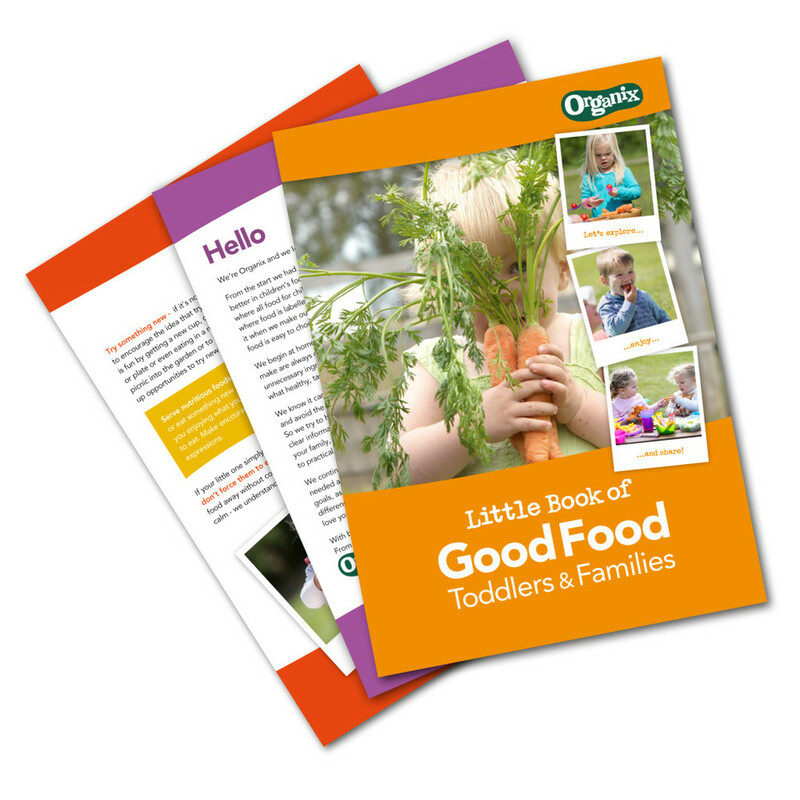 To download a copy of The Organix Little Book of Good Food - Toddlers & Families visit www.organix.com/lovegoodfood and you can watch the Love Good Food video at: #lovegoodfood. Join the conversation at #LoveGoodFood.